Boiler breakdowns can be extremely stressful. This guide will help you to troubleshoot some common faults with Baxi boilers. Whilst some issues can be fixed very easily. The majority will require a Gas Safe / boiler repair engineer to visit, diagnose and fix the fault. Or, if want to invest in a new boiler, we’d recommend checking out BOXT. Due to them being part owned by Bosch, you’ll get a new Worcester boiler on the wall dirt cheap. You can get a fixed price on-screen in less than two minutes here. This is a common fault on not just Baxi boilers, but all brands. You turn on a tap or shower, and nothing happens. At best, you’ll notice it only gets Luke-warm, and that’s with the heating on. The problem likely lies with the diverter valve. Or a part in the diverter valve such as the diaphragm. We’ve covered diagnosing a faulty diverter valve in detail here. After some careful inspection, you might be lucky in that the issue is just the diagram washer. However, the time needed to disassemble the boiler and fit new parts means it’s much more economical to replace the whole diverter valve. Costs for fixing a diverter valve will sit around £250-350. 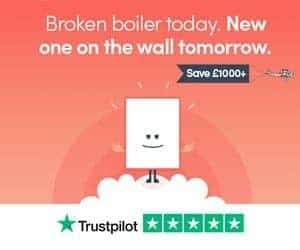 If you’d prefer to invest that cash in a new boiler with a long warranty, you can get a price online here. One of the most common faults from the Baxi HE range is banging noises coming from the boiler. This is not usually a constant banging noise. It tends to happen only when the boiler cycles on and off, or when it’s started for the first time. It’s hard to pinpoint this as the exact problem without taking off the cover and having a good look, as well as disregarding any other potential issues. The most common fault relating to banging on the Baxi HE range is a broken burner. The newest burner we have seen break has been 4 years old. When they break sometimes they’ll display a 128 fault code. In general, this is usually a more common issue when the boiler gets to be 6 years or older. The cost of the fix will depend on the exact model. In general, expect to £320-450 including labour to have this replaced. As with most old boilers. If this is a fault on an old Baxi (5-6 years or older), it’s usually much more economical to replace it. It’s likely there are many other parts coming to the end of their life, and sometimes they simply compound. Have a Gas Safe engineer come around and make their assessment before going for a replacement. If a replacement is the right choice, you’ll find good prices on brand new Worcester boilers here. This Baxi boiler fault is common with the Baxi Solo range, the 105HE and the 133HE Plus. If you find a pool of water below the boiler. We’d expect to see 118, 119 or 270 fault codes if this is the case. Although many older boilers last a long time, their parts degrade. Pumps are prone to breaking a seal when they come under excess pressure (such as a block in the pipework) or they work themselves loose. On the above models, some internal parts were made of plastic. Years of vibration means they are prone to cracking. This is particularly the case around the diverter valve. First, the problem needs to be isolated. Once it is, the unit needs to be replaced. Baxi do offer a spares kits for pumps and internal housing. The problem is, no boiler fix is an easy job. The time and money spent on labour means that replacing the whole pump or housing is much more economical. And, make sure the engineer takes a good look at the internal components. It’s not unknown for leaks to cause havoc. After leaking on other metal components, it’s very likely there are other parts that have rusted and need to be replaced. All boilers are prone to lockouts from time to time, but this fault has been particularly common with the Baxi Solo 1PF and 2PF over the years. The root of the problem comes from the boiler overheating. The boiler locks out to preserve any internal components and further damage. This is not easy to diagnose without fault codes. Asides from leaks, there are other problems that can cause a boiler to lock out including fault codes: 110 (overheating), to 160 (a faulty fan) or even 166 (air pressure switch fault). A common culprit for this fault on Baxi boilers is a lack of pressure. If your system is set lower than 1.5 bar then it won’t operate correctly. Now, the quick fix is to top up the pressure using the filling loop. Once you’ve topped up the pressure, you’ll need to reset the boiler. On the Baxi 1PF you’ll see an orange button. On the 2PF there will be a red button. These buttons will reset the boiler and get it up and running again. But here lies a problem. The boiler has lost pressure. And that means there is a problem that needs to be fixed. Most Baxi boiler faults where the system has lost pressure are because of leaks in the system. If you’ve gone through the reset steps in “Baxi Boiler Fault 4”, the issue could be purely ignition related. This is common in the 100e and 105e. An engineer will need to go through a troubleshooting process to determine what the problem is. A common assumption is that as this is ignition related, if the ignition leads look old, replacing them will fix the problem. It’s a possibility, but that’s not the right route to take before considering all other options. The fix here is usually just replacing the faulty part. Remember, the ignition leads have failed due to excess debris, ask the Gas Engineer to clean out the system so it doesn’t happen again. This will also ensure that other parts in the system are not exposed to this debris. If none of the above covers the fault you’re experiencing with your Baxi boiler, submit a comment below and I’ll reply as soon as I can.